Our Web site has been designed to be easy to use and doesn't assume you are an Internet-guru! If you ever need to refer back to the Help information on this page, simply click on the swallows at the top of the Contents Menu on the left side of your screen. To speed up down-loads the Properties pages are primarily text-based descriptions. Control over which pictures of which houses you see is in your mouse! Each of the descriptions will have one or more hot-links connected to the relevant images, simply click on whichever you would like to view. When viewing property details, you will see symbols like the ones above. If you are unclear as to their meaning, simply click on them for an explanation. You will also find the Damage Deposit Codes here. At the right-hand side of your screen you should see a standard Windows-type scroll-bar. This enables you to scroll the page you are currently using up and down in the normal way. If you need to look at a previous screen, use either the options on the Contents page or your browser's BACK and FORWARD buttons. Photos on this site which are not taken by CC are variously courtesy of A. Choisnet, Photothèque, Comité Départementale du Tourisme and individual property owners. 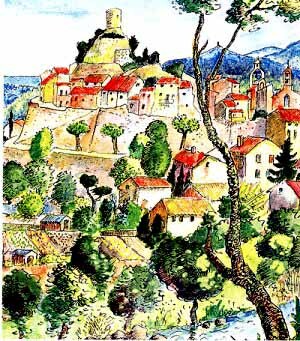 "View of Laroque des Albères"
Born in Strasbourg and now firmly rooted in Roussillon, Bruno has exhibited worldwide during the last 20 years. His talents extend beyond painting to mosaics, stained glass and poetry. He may be contacted on 04 68 89 70 78 or at 2 Ancien Chemin Royal, 66740 St Génis des Fontaines. During the January 2007 site makeover, we had debated whether this page was still necessary! If you've reached this far down then perhaps it is ... or you are simply the last of the avid readers. The site is 12 years old, and its amazing to think that all those eons ago we needed to tell people how to click on a link and move a scroll bar. Well even if it's no longer totally necessary let's just see it as a little bit of Internet History.